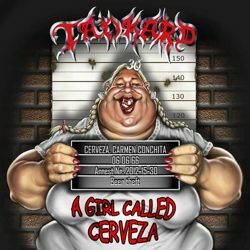 German thrash metal hero, Tankard, has revealed the album cover for its upcoming Nuclear Blast debut, “A Girl Called Cerveza“. Patrick Strogulski, who is a student of former Tankard cover artist, Sebastian Krüger, brought the artwork to life. “A Girl Called Cerveza” will be released on July 31st in North America, and is currently being produced at the famous Studio 23 in Frankfurt, Germany with renowned producer, Michael Mainx (BÖHSE ONKELZ, DER W, DISBELIEF, D-A-D).